Voila! My Beehive hair! 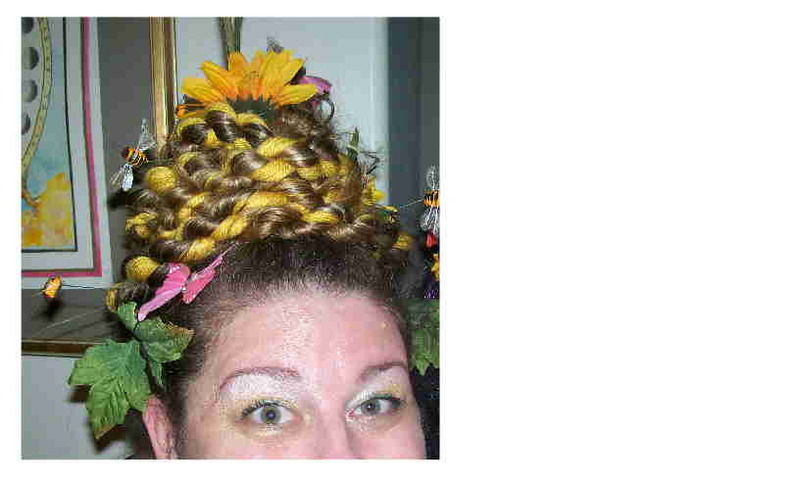 Yes, that is my real hair, braided together with yellow yarn, adorned with bees and butterflies and all sorts of creatures. It was fun! Can’t take credit for the idea, though- I got it from Kage’s post in Tales– which linked to Martha Stewart’s website. What can I say? The woman has mad ideas. Or at least she pays well the people who do. The boys are super-wild ninja wolverine creatures, and Abby is a bee girl. We are now officially the M’s house of Sugar Insanity and Mayhem. Heaven help us all! Have a fun (and reasonably safe) night, everyone! Today was housecleaning day, and I was on the warpath all day- so just before dinner when Abby came in the kitchen sucking on a squirt bottle of spray cleaner, I completely freaked out, dumped her in the sink, and speed-dialed Poison Control. 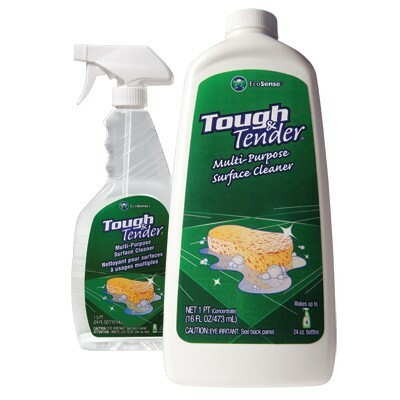 Turns out, the cleaner I use, EcoSense Tough n’ Tender by Melaleuca is absolutely safe. Not that I suggest letting your kid drink it, but the Poison lady was amazed that nothing in it was a danger. Hooray! So mamas: get that Poison Control number plastered by your phone! Oh, and switch to non-toxic cleaners for you home- because while in an ideal world I would follow Abby around gazing at her marvelousness and never evereverever leave a spray bottle on a window sill when the phone rings, the truth is, well, it’s not pretty. My brain doesn’t always work, and sometimes I do dumb stuff. I HATE the smell of peanut butter. Positively loathe it- and peanut butter is all Beanie will eat. Go figure. One of my top front teeth is fake. I knocked it out roller skating when I was 12 on Super Bowl Sunday. It makes me absolutely nuts when a fly gets in the house. All activity has to stop until the fly is either smooshed or let outside. Squirting them with window cleaner is a great way to knock them down, then squish them, just in case you feel like I do. I’ve never, ever seen a horror movie. Of any kind. Period. At my wedding reception, we had small wooden figures of Adam and Eve on top of the cake, and gave out apples for favors. Red or blue food dye makes me itch like crazy, and I think I’ve passed that little quirk onto Beanie. I say I don’t collect anything, and I’m adamant about that, but I have soft spot for antique egg-cups and, it’s a secret, but I love glass birds on my Christmas tree. Don’t tell anyone! I wish you could have seen how darling Beanie looked for our Primary program today! He marched right up the podium and held his picture high over his head, Norma-Rae style, and just grinned out at all the people. He didn’t say anything, just smiled and smiled and smiled. Then waved at me and said “Hi Mom!” It was pretty dang cute. Jeffrey actually spoke during church today, too! It’s been his habit to crawl under the podium as soon as he gets up there and sees all the eyeballs, but not today- he did wonderfully, and is now filled with the confidence of a boy who had conquered a personal dragon. It’s been a friendly week at the M’s. Busy. Hectic, but friendly. Monday was watching kids for friends. On Tuesday, Mo came over and showed me how to actually use the piles of make-up I’ve accumulated over the years- and she’s good, people, just for the record. She made me look pretty! Friday we had friends over for dinner, Saturday was soccer day, and Sunday we went to some other friends’ house for lunch after church. Busy. Abby has suddenly morphed from my sweet, cute, mild-mannered baby-girl into a mountain climber. Nothing is safe. She scales the bookshelves, the chairs, moves furniture to get what she want, and positively loooooooves the computer. The other day I caught her on my desk- she had seventeen different windows open- pleased as punch. I also caught her on the dining room table, swinging the chandelier back and forth, but we won’t talk about that. She’s wearing me out! Dude! Pumpkins were eight bucks a piece at Safeway this week!! I’m glad we have a u-pick place- three monster squash, six bucks. That’s all I’ve go to say about that. I’m about ready to ask Jeffrey be moved to another teacher. Anyone have any experience with that? While I don’t want my kid pegged as a son of a troublemaker, I’m less and less pleased by his milquetoast of a teacher. The Red Sox just swept the World Series! Go Sox… although, I have to admit, I’m not as verklempt as I was last time. Jeff scored six goals at his soccer match on Saturday. Beanie huddled in my lap to try and stay warm, while Abby pulled her socks and shoes off, and kept insisting on running onto the field. On my mantle is a small framed antique embroidery that says: Contentment is not the fulfillment of what you want, but the realization of what you already have. When I was a younger woman, I wanted so desperately to be smaller. I wanted tiny cute feet that fit in normal shoes, ladylike hands, manicured nails and a poised demeanor. Fact: that’s not me- and each time I’ve tried on the that shoe, it has pinched so badly it figuratively flew of my foot and shattered a window across the room. Not doing it anymore. I’m going to sing a song of praise, I’m going to stop buying into anyone else’s notion of what it means to be a woman, and embrace myself. I’m overweight. Always have been. The fact is, being overweight is what helped me deliver three healthy babies while losing 20 pounds each time because of hyper-emesis. If I had been skinny, who knows what would have happened to my babies. My feet are big. Like, size 12 big. Yeah, not kidding. My hands are big. My toes are freakishly long. The fact is, these big hands make beautiful things, calm babies, cool fevered brows and paint anything my mind imagines. My enormous feet look right on my body, and they move me through the world. My toes look just lovely with shiny red polish. My German roots are showing, and I love them. My hair is insane. I feel so unkempt most of the time, because of the nest of curls. When I want to feel sleek and put together, I iron the crap out of it. But it always reverts back. It gets complimented and noticed more than anything about my appearance, and I’ve never seen anyone with hair just like mine. While the craziness bugs me, I also know it can be startlingly pretty; it’s one of my vanities. So there it is. The things I’m most self-conscious about. The things that used to make me feel like a bull in a china shop, but now are just part of who I am. One of the best things about getting a little older, getting a few more years under your belt, is a certainty of who you are. A calmness and confidence in what you do- and how you do it. Contentment is the realization of how much you already have. We actually had one tonight. Remember in Stand By Me? It happened at our dinner table! Abby choked on a piece of potato, and threw up all over herself, her high chair and her plate. While I was running for a towel, Beanie looked at Abby’s piles o’ barf and promptly tossed his dinner onto the table. DH and I both stood there, mid-move, like deer in the headlights, as we watched the waves of barf overtake our dining room. Grabbing a roll of paper towels, I covered Beanie’s pile to avert any further contributions, and began to clean Abby- and by clean, I mean strip her down. When I did so, I inadvertently got barf in her hair, too. Turning to grab the paper towels, I accidentally nudged the towel off of Beanies pile, which Jeffrey gazed at and began to promptly gag. DH is upstairs bathing Abby, and I have a giant, hefty super-stretch bag o’ barf in the garage. Wanna come over for dinner?